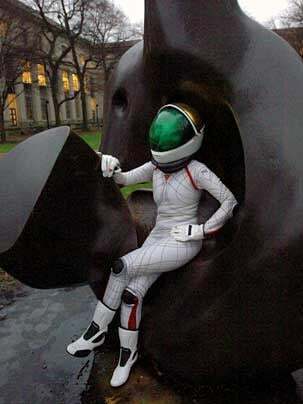 A professor of aeronautics and astronautics and engineering systems at MIT has come up with a revolutionary new space suit that she hopes will take the place of the traditional, bulky number worn by astronauts over the past four decades. Although still only a prototype, Dava Newman's spandex and nylon Biosuit will offer space travellers more mobility and flexibility to explore the planets. If given the nod, Professor Newman reckons the Biosuit could be ready for the first human visit to Mars,thought to be about a decade away. Initially funded by NASA's Institute for Advanced Concepts, the Biosuit has been seven years in the making. Rather than using gas pressurization to protect the astronaut's body from the vacuum of space, a method used by the current 300-pound suits (astronauts expend around 70 or 80 per cent of their energy just trying to move themselves in the suit) the Biosuit uses mechanical counter-pressure, swaddling the body in tight layers of material. Apparently it's down to the pattern of the lines on the suit, which provide a stiff "skeleton" of support as well as maximum mobility.